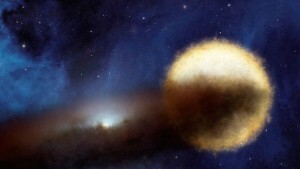 Artist's Conception of Epsilon Aurigae. Copyright Spitzer/JPL. The fantastic title of today’s paper refers to the odd behavior of the ε Aurigae system, which has puzzled astronomers for nearly two hundred years. Back in 1821, German amateur astronomer Johann Fritsch noted that the F star ε Aurigae appeared much dimmer than usual. Fritsch’s observation inspired other astronomers to observe the ε Aurigae system and in 1903 German astronomer Friedrich Wilhelm Hans Ludendorff published the paper “Untersuchungen über den Lichtwechsel von ɛ Aurigae” noting that the dimming occurred every 27.1 years. Ludendorff’s observation that the dimming was periodic led to the conclusion that some mysterious object (perhaps an invisible monster?) was orbiting the star and blocking some of the star’s light from reaching Earth. The only remaining wrinkle was that the dimming lasted for two years, implying that whatever was blocking the star was truly enormous. In 1937, Kuiper, Struve, and Stromgren argued that the object orbiting the F star was a “semitransparent” infrared star. In their model, the system would dim every two years as the cool, bloated, infrared star passed in front of the F star, but some light from the F star would always reach the observer so the spectral signature of the F star would always be visible. 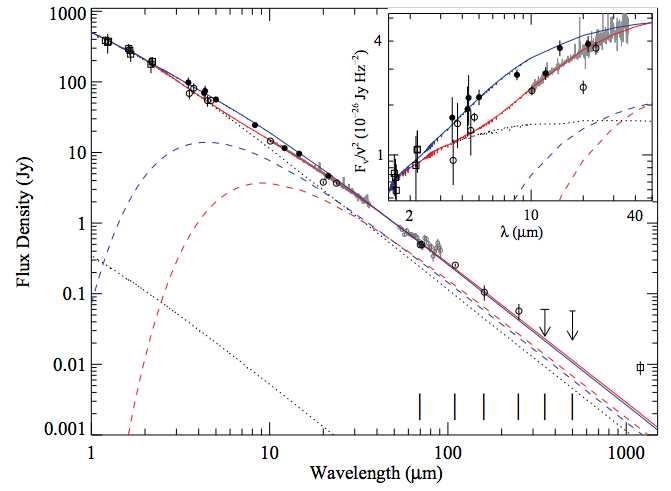 Although the Kuiper, Struve, and Stromgren model explained some of the features of the light curve, Su-Shu Huang pointed out in a 1965 paper that the “semitransparent” star was non-physical and that the spectrum of the system should reveal spectral features from the cool, infrared star in addition to the lines from the F star. Huang presented a new theory that the object eclipsing the F star was actually a thick, edge-on disk. In 1971, Wilson argued that the eclipsing object was a thin, tilted disk with a central opening. The lack of material at the center of the disk would account for the observed brightening of the ε Aurigae system at mid-eclipse. Both Huang and Wilson were on the right track, but they did not know what was at the center of the eclipsing disk. 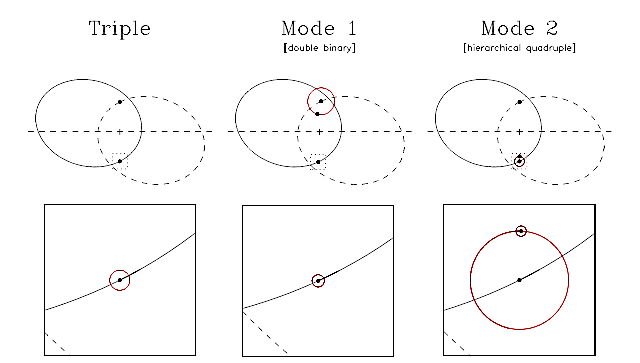 Today we know that the ε Aurigae binary star system is located 625 parsecs away and consists of a 2.2 solar mass post-asymptotic giant branch (evolved) F-star and a 5.9 solar mass main-sequence B dwarf with an orbital period of 27.1 years. The B dwarf is surrounded by a large dust disk, but astronomers are still working to constrain the disk properties. As the two stars orbit each other, astronomers on Earth are able to observe different regions of the dust disk surrounding the B dwarf. When the B dwarf passes in front of the F star during primary eclipse, astronomers are able to study the cool back side of the dust disk on the side of the B dwarf opposite the F star. Astronomers can study the warmer front side of the dust disk by observing the system at opposition when the B dwarf lies on the far side of the F star. Hoard et al. use new data from the 2011 primary eclipse to build on a previous paper from the same team with an equally amusing title: “Taming the Invisible Monster: System Parameter Constraints for epsilon Aurigae from the Far-ultraviolet to the Mid-infrared.” In the first paper, Hoard et al. presented a model of the spectral energy distribution of the ε Aurigae system that accounted for contributions from the post-asymptotic giant branch F-star, the main sequence B dwarf, and the dust disk surrounding the B dwarf. In this paper, they present new infrared photometry from the European Space Agency’s Herschel space telescope and fit separate models to the the warm, front side of the dust disk and the cold, far side of the dust disk. As shown in the plot below, they find that the side of the disk facing the F star is best fit by a 1150K blackbody while the side of the disk on the opposite side of the B dwarf is best fit by a 550K blackbody. Spectral energy distribution of epsilon Aurigae. The data points mark the observed flux density corresponding to the cool side (unfilled circles) and warm side (filled circles) of the disk. 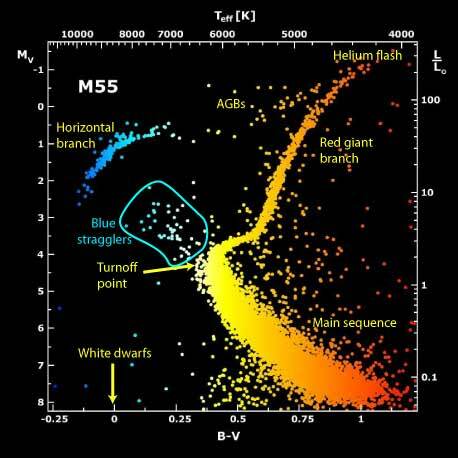 The dotted lines show the SED of the B dwarf (lower line) and the evolved F star (upper line). The red dashed line is a 550K blackbody fit to the cool disk and the blue dashed line is a 1150K blackbody fit to the warm disk. The solid red and blue lines mark the total SED for the warm disk side and cool disk side , respectively, including contributions from the disk and both stars. The inset in the upper left highlights the difference between the cool disk and the warm disk from 1-50 microns. Figure 2 from Hoard et al. 2012. There are still many unanswered questions about the intriguing ε Aurigae system, but the monster might reveal a few more secrets during the upcoming secondary eclipse in 2027. We should be able to learn more about the disk properties in the years leading up to the eclipse as the angle between Earth, the disk, and the F star changes. The Impossible Star It’s Not Easy Being Blue Star Hoppers: Planets in Evolving Binary Star Systems Can Binary Star Systems Harbor Habitable Planets?